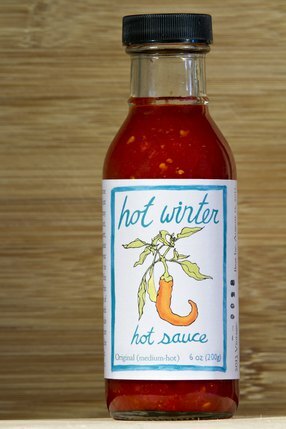 Two bottles of our Original label hot sauce. 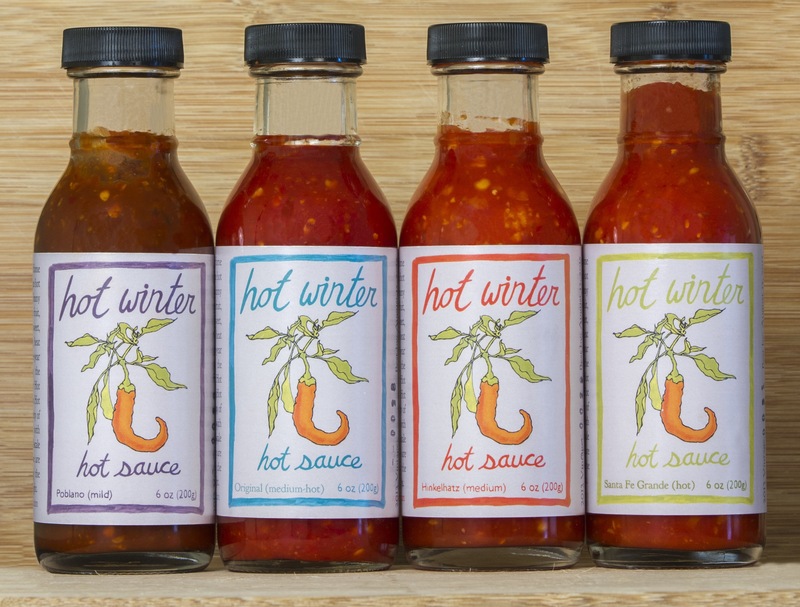 This product is made from All organic ingredients and features my very own chile pepper, cultivated from an off-type Jimmy Nardello during my time working at Mountain Home Farm alongside the glorious Klamath River in Northern California. This variety has a robust but not overwhelming heat, that builds slowly alongside a surprisingly complex mouthful of peppers. Sample FOUR varieties of Hot Winter! 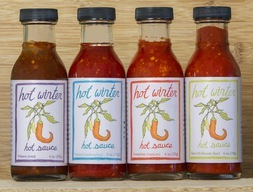 Each blend features a different chile, giving each label a different heat level and flavor profile. 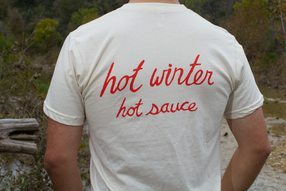 The Poblano uses smokey, half-green chiles for a delicious "mild" hot sauce with just a wee kick. Hinkelhatz blends the super spicy "chicken heart" pepper with the much milder Hungarian Hot Wax, to create a balanced sweet/spicy blend that is reminiscent of Sriracha (if Sriracha were made with much higher quality ingredients). 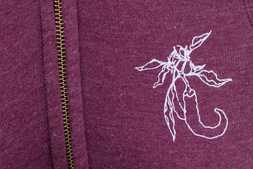 The Santa Fe Grande chile has a surprisingly floral aroma, which still tastes delicious, even with the added Bulgarian Carrots, which add extra heat. 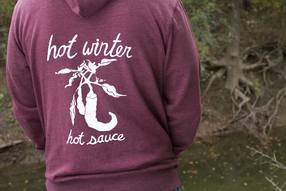 Our logo is a hand drawn sketch of the actual Hot Winter Pepper plant. 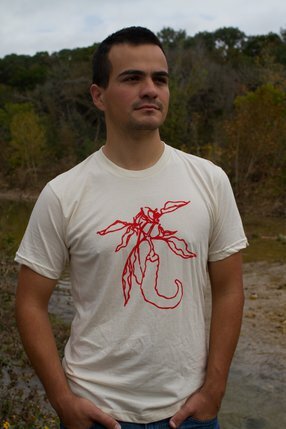 I loved it so much I had it printed as a shirt. 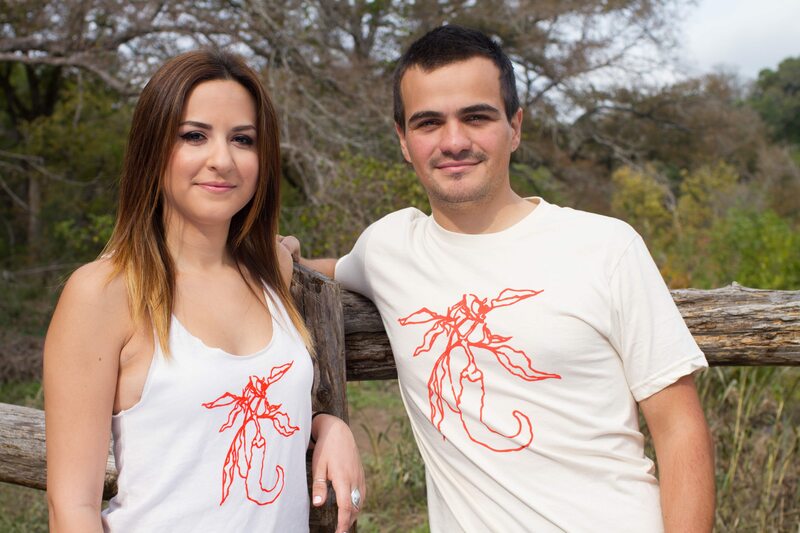 Because Hot Winter is committed to sustainable agriculture, I chose 100% organic cotton American Apparel t-shirt stock, as well as a woman's tank printed on Alternative Earth's Eco Heather (a blend of organic cotton, recycled polyester and rayon). 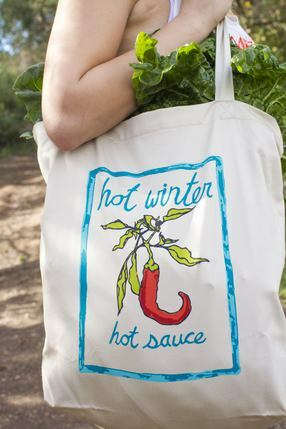 Our tote bags are printed on sturdy 100% organic cotton bags. They have a generous shoulder strap, that makes them a convenient choice for visiting your local farmer's market. 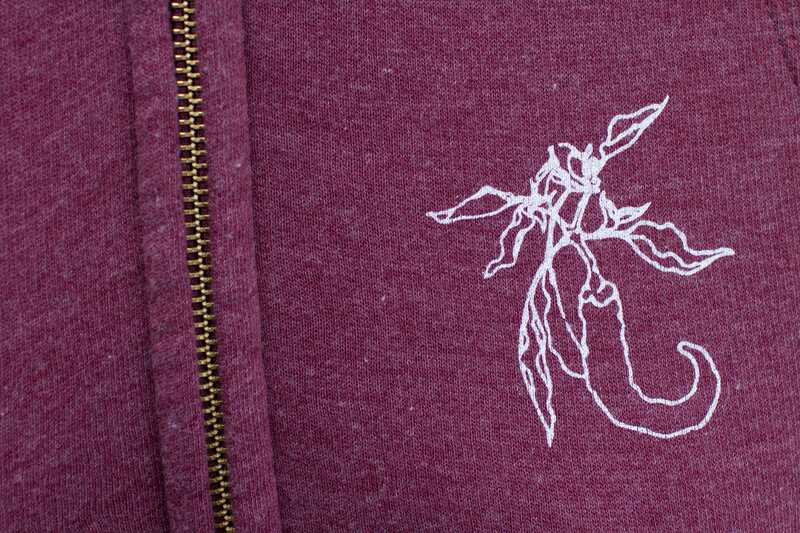 We also have our logo printed on super cozy hoodies: 55% organic cotton and 45% recycled polyester. Please contact us within 14 days after receiving the item for refunds and exchange.